Are worms okay for my baby corn? I very recently got my first snake, an extremely tiny baby corn. I went to the pet store one day and asked a little bit about the corn snake and when and what it had been eating. The woman said the snake was too small to eat pinkies, so she suggested chopping the pinkies up. The next day I went back to the store and a different woman came to help me with the snake. I asked a few more questions and the woman said to cut some worms in half and feed them to my snake. She said that's what the corn had been eating. i didn't know much about feeding snakes worms, but was a little skeptical about how healthy worms were. The woman offered to get some worms from a back room, and not knowing what to do I just said that she could go get the worms. The whole situation made me a little nervous and confused, so I just decided to go along with what the worker said. Having the worms made me think I didn't have to pick up some pinkies from the store. Now a day later, I'm wondering whether or not it's good to feed my baby corn snake worms. No, that is not okay. Unless the baby snake is less than 5 grams in weight, it can take a whole or half pinky (frozen, cut in half length-wise, then thaw in a baggy in warm water) without issue. As I'm sure plenty of much more experienced folks on here than me will strenuously confirm, it most definitely is not okay to feed a corn snake worms. Corn snakes have evolved to eat rodents and on occasions (I believe from my research from reliable, credible sources) small birds / chicks and eggs. These items provide them with the nutrients they need to grow and thrive, and contain nothing that will harm them. 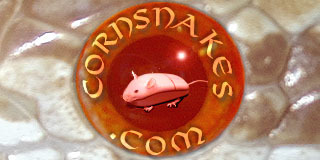 As I understand it, captive corn snakes should only be fed mice of sizes appropriate to the size of the snake's size. Some feed them rats / rat pups, but others have questioned whether these have the appropriate spread of nutrients. FWIIW, I personally don't blame you for your confusion on such a basic and fundamental point. There is some truly awful advice out there from folks who appear to be experts, including reptile store owners. As I have previously posted, I myself received laughably bad advice from the reptile dealer I bought our corn snake from. How are novices like you and me supposed to know what advice is good and what is bogus? The answer is: this forum. It has world-renouned corn snake experts and pioneers in it, and any suspect advice is soon rooted out. I strongly suggest you go through the "stickies" on here dealing with corn snake care and perhaps get yourself a reliable corn snake book like the one by Kathy Love. Absorb the information and advice from these sources and be very suspicious of anything that conflicts with it! Hope this of assistance - very best of luck to you and your little snake! Well, honestly, what are the chances that a baby corn snake is going to find pinky mice to eat in the wild? My concern would be the proportional lack of calcium in a worm as compared to a pinky... or a baby lizard, which they are more likely to find in the wild than a pinky probably. One or two wouldn't be harmful, I suspect, in the long run but not as a staple. The lack of calcium will hinder development. Pinky mice are 1.6% calcium, and earthworms are only 0.95%. The amount of phosphorus they contain is half that of a pinky. Well, IMHO given that these snakes eat pretty much nothing but mice; that they have evolved to an extremely high degree to detect and seek out rodents; that they have the inherent ability to get onto nooks and crannies where rodents have their nests; that given their diet they occur where there are concentrations of rodents; and that hatchling corn snakes in the wild are entirely on their own and must hunt out food or they die... I would say the chances are pretty good! Strikealight, where their range in the wild extends, the vast majority of available small prey is baby lizards, especially anoles. Many a non-feeder hatchling will take lizard-scented prey. Just as while captive bred hognoses feed on mice, in the wild they primarily eat frogs. Duly noted - didn't appreciate that. I thought corns were pretty much synonymous with rodent populations and that they may have got their name from being commonly found in corn barns for that very reason. I would also have otherwise thought it far more plausible for a hatchling corn to able to tuck in on a nest of helpless baby mice than to regularly catch something as quick as a baby anole. But in the context of this thread, isn't it still a big leap between prey with hard skeletons on the one hand (including rodents and lizards) and worms on the other? Also, isn't it the case that to maximise the chances of survival in a hatchling corn it is by far better to feed it on mice? I have never heard of any noteworthy corn breeder / keeper ever feeding with worms, but I again stand to be corrected. About the same as my average customer figuring out where to find baby lizards in Ohio. I seriously doubt that a baby corn snake would find a nest of baby mice undefended by the mother. And that the mother mouse would just stand by and allow that to happen. Interestingly enough many years ago when I was working for the Florida Legislature, a coworker mentioned that he had caught a baby corn snake several weeks ago. In the discussion I asked him where he was getting his pinky mice from to feed it. The guy looked at me like I was speaking a foreign language. So I had to explain what "pinky" mice actually were. His expression didn't change. He told me that he was feeding it earthworms, which it was readily feeding upon. I had honestly never considered, prior to that incident, earthworms as being a food source for baby corn snakes. But obviously they were. Honestly, I've never tried to feed a baby corn earthworms myself. One reason being is that I always had a steady supply of one day old pinky mice. The second reason is that earthworms are just not as common where I live as you would think they should be. The soil here is mostly sand. When I lived in Maryland, any time you stuck as shovel in the ground, you would pull up several earthworms in the dirt. Here, it is relative rare to find one.